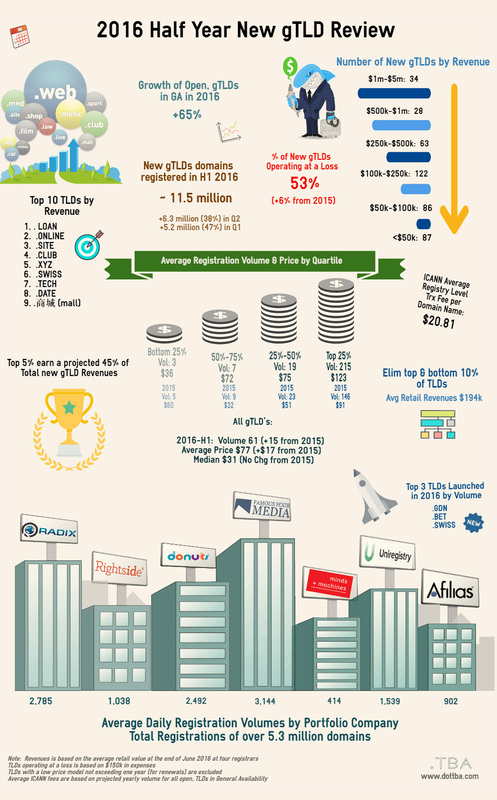 This post provides an overview from The First Half of 2016 infographic, reflecting on some of the intriguing highlights of the new gTLD industry. – Revenues are based on the average retail price over four registrars (101domain, eNom, GoDaddy and United Domains) at the end of June 2016. The infographic suggests that .loan had the highest revenue in the period, but I'm not sure that's correct. If you look at nTLDstats for that registry, the top 5 registrars are from China, and it's highly likely those domains were sold at very low prices. Instead, you used the "average retail price over four registrars (101domain, eNom, GoDaddy and United Domains) at the end of June 2016", which is going to be way off, given those registrars account for a tiny percentage of the domains that were actually sold by that registry. GoDaddy only sold 370 of the 248,656 registered domains in that TLD (at the time of this post). George, thank you for your input. As you probably know, often there is minimal visibility on special promotions and rebates unless one is a Registrar, but your detailed observation is likely correct. Given limited transparency and access to all forms of data, the infographic is less than perfect but that is not its intent. The goal of this infographic, both prior and current forms, is to set a marker (the proverbial stick in the sand) and consistently and methodically measure from it only eliminating TLDs that produce out-of-band characteristics that will grossly skew results. A message for all, I welcome as much data as people and companies are willing to send. I will gladly seek ways to integrate data to enhance accuracy. I will add at least one Chinese registrar on the next analysis to determine the impact on revenues along with a comparison to prior periods. Lastly, I'd like to point out that much of the data presented here is based on forward projections and not just solely based on actual data. We are working with other partners on a plan to complement this projected data with actuals. Stay tuned and of course all feedback is welcomed and appreciated! You're welcome, Christa. One source of data might be the public financial statements of Rightside and Minds+Machines. And, to a lesser degree, those of other public companies like CentralNic, Neustar, GoDaddy, Tucows, Web.com and Endurance (although, obviously not as good, since they're not pure new gTLD registries, but sometimes they'll break down some revenues, allowing one to glean bits of knowledge, sometimes from the footnotes). Until Donuts goes public, the industry data will likely remain very poor, so one would have to put in quite a bit of work to make decent inferences from whatever is actually available. Kudos for trying! Thank you for publishing this - its always nice to see different perspectives and analysis on the nTLD industry and everyone will have a comment or two about it. The fact you published this, is an opportunity to view another perspective on the current landscape of the nTLD space. I would like to invite you to view the analysis done by Dataprovider.com on more than 900+ nTLD's analyzed with as much insights reported into each zone. We are currently providing nTLD Registries with access to the system to gain monthly reports on their TLD's to hopefully help impact renewals positively. It is very interesting to see how many of these Registries take interest. It would also be interesting to see how many business have adopted the nTLD's as part of their business identity. Very soon, I believe we will have insights into that as we index Company names for websites analyzed from these nTLD zones. In any case, feel free to message me at sam@dataprovider.com for that walk through. @Samantha - "It would also be interesting to see how many business have adopted the nTLD's as part of their business identity." Also, you might visit Registered.today to view which new TLD's are registered daily. This is quite eye-opening. I, for one, can appreciate the incredible amount work that has gone into this. Many thanks for publicly posting this - as we all try and figure out what is ACTUALLY happening in the gTLD marketplace and what to do next. Hello Christa and thank you for this post. We actually posted its link on gTLD.club and its Newsletter. I would have saved myself some time if I used your singular vs. plural page and also like how you have grouped TLDs within the various classes. Thank-you for the comment and for sharing the post! ...I would provide more reports. The good thing is that numbers are written week by week so it is a good method to check which kind of TLD works and which does not. Local Time: Friday, April 19, 2019 03:33 AM PDT – Page Load: 0.4055 Sec.